This article is about the biblical prophet. For the biblical book, see Book of Ezekiel. For other uses, see Ezekiel (disambiguation). Ezekiel (/ɪˈziːkiəl/; Hebrew: יְחֶזְקֵאל Y'ḥezqēl [jəħɛzˈqēl]) is the central protagonist of the Book of Ezekiel in the Hebrew Bible. In Judaism, Christianity, and Islam, Ezekiel is acknowledged as a Hebrew prophet. In Judaism and Christianity, he is also viewed as the 6th-century BCE author of the Book of Ezekiel, which reveals prophecies regarding the destruction of Jerusalem, the restoration to the land of Israel, and what some call the Millennial Temple (or Third Temple) visions. The name Ezekiel means 'God strengthens'. The author of the Book of Ezekiel presents himself as Ezekiel, the son of Buzzi, born into a priestly (Kohen) lineage. Apart from identifying himself, the author gives a date for the first divine encounter which he presents: "in the thirtieth year". If this is a reference to Ezekiel's age at the time, he was born around 622 BCE, about the time of Josiah's reforms. His "thirtieth year" is given as five years after the exile of Judah's king Jehoiachin by the Babylonians. Josephus claims that Nebuchadnezzar of Babylonia's armies exiled three thousand Jews from Judah, after deposing King Jehoiakim in 598 BCE. According to the Bible, Ezekiel and his wife lived during the Babylonian captivity on the banks of the Chebar River, in Tel Abib, with other exiles from Judah. There is no mention of him having any offspring. 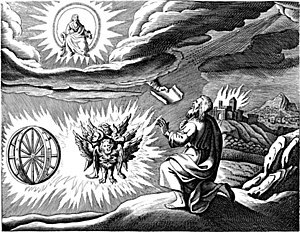 Ezekiel describes his calling to be a prophet by going into great detail about his encounter with God and four "living creatures" with four wheels that stayed beside the creatures. For the next five years he incessantly prophesied and acted out the destruction of Jerusalem and its temple, which was met with some opposition. However, Ezekiel and his contemporaries like Jeremiah, another prophet who was living in Jerusalem at that time, witnessed the fulfillment of their prophecies with the siege of Jerusalem by the Babylonians. On the hypothesis that the "thirtieth year" of Ezekiel 1:1 refers to Ezekiel's age, Ezekiel was fifty years old when he had his final vision. On the basis of dates given in the Book of Ezekiel, Ezekiel's span of prophecies can be calculated to have occurred over the course of about 22 years. The last dated words of Ezekiel date to April 570 BCE. 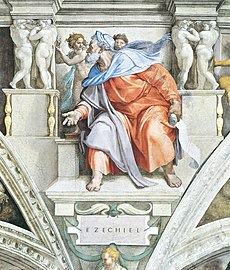 Ezekiel, like Jeremiah, is said by Talmud and Midrash to have been a descendant of Joshua by his marriage with the proselyte and former prostitute Rahab. Some statements found in rabbinic literature posit that Ezekiel was the son of Jeremiah, who was (also) called "Buzi" because he was despised by the Jews. Saint Bonaventure interpreted Ezekiel's statement about the "closed gate" as a prophecy of the Incarnation: the "gate" signifying the Virgin Mary and the "prince" referring to Jesus. This is one of the readings at Vespers on Great Feasts of the Theotokos in the Eastern Orthodox and Byzantine Catholic Churches. This imagery is also found in the traditional Catholic Christmas hymn "Gaudete" and in a saying by Bonaventure, quoted by Alphonsus Maria de' Liguori: "No one can enter Heaven unless by Mary, as though through a door." The imagery provides the basis for the concept that God gave Mary to humanity as the "Gate of Heaven" (thence the dedication of churches and convents to the Porta Coeli), an idea also laid out in the Salve Regina (Hail Holy Queen) prayer. The Story of Gog and Magog is mentioned in the 18th Surah of the Quran, Al Kahf. Ezekiel is recognized as a prophet in Islamic tradition. Although not mentioned in the Qur'an by the name, Muslim scholars, both classical[a] and modern[b] have included Ezekiel in lists of the prophets of Islam. The Qur'an mentions a prophet called Zul-Kifl. This prophet is sometimes identified with Ezekiel although Zul-Kifl's identity is disputed. Carsten Niebuhr, in his Reisebeschreibung nach Arabian, says he visited Al Kifl in Iraq, midway between Najaf and Hilla and said Kifl was the Arabic form of Ezekiel. He further explained in his book that Ezekiel's Tomb was present in Al Kifl and that the Jews came to it on pilgrimage. The name Zul-Kifl or more correctly Dhū l-Kifl (ذو الكفل) would mean "Possessor of the Double or Fold" (ذو dhū "possessor of, owner of" and الكفل al-kifl "double, folded"). Some Islamic scholars have likened Ezekiel's mission to the description of Dhul-Kifl. When the exile, monarchy, and state were annihilated, a political and national life was no longer possible. In the absence of a worldly foundation it became necessary to build a spiritual one and Ezekiel performed this mission by observing the signs of the time and deducing his doctrines from them. In conformity with the two parts of his book, his personality and his preaching are alike twofold, and the title Zul-Kifl means "the one of double" Aside from the possible identification of Zul-Kifl with Ezekiel, Muslims have viewed Ezekiel as a prophet, regardless of his identification with Zul-Kifl. Ezekiel appears in all Muslim collections of Stories of the Prophets. Muslim exegesis further lists Ezekiel's father as Buzi (Budhi) and Ezekiel is given the title ibn al-adjus, denoting "son of the old (man)", as his parents are supposed to have been very old when he was born. A tradition, which resembles that of Hannah and Samuel in the Hebrew Bible, states that Ezekiel's mother prayed to God in old age for the birth of an offspring and was given Ezekiel as a gift from God. The tomb of Ezekiel is a structure located in modern-day south Iraq near Kefil, believed to be the final resting place of Ezekiel. It has been a place of pilgrimage to both Muslims and Jews alike. After the Jewish exodus from Iraq, Jewish activity in the tomb ceased, although a disused synagogue remains in place. ^ The greatest depth to the figure is given by Abdullah Yusuf Ali, in his commentary; his commentary's note 2743: "If we accept "Dhul al Kifl" to be not an epithet, but an Arabicised form of "Ezekiel", it fits the context, Ezekiel was a prophet in Israel who was carried away to Babylon by Nebuchadnezzar after his second attack on Jerusalem (about BCE 599). His Book is included in the English Bible (Old Testament). He was chained and bound, and put into prison, and for a time he was dumb. He bore all with patience and constancy, and continued to reprove boldly the evils in Israel. In a burning passage he denounces false leaders in words which are eternally true: "Woe be to the shepherds of Israel that do feed themselves! Should not the shepherds feed the flocks? Ye eat the fat, and ye clothe you with the wool, ye kill them that are fed: but ye feed not the flock. The diseased have ye not strengthened, neither have ye healed that which was sick, neither have ye bound up that which was broken ...... etc. (Ezekiel, 34:2–4)." ^ a b Terry J. Betts (2005). Ezekiel the Priest: A Custodian of Tôrâ. Peter Lang. p. 51. ISBN 978-0-8204-7425-0. ^ Not to be confused with modern day Tel Aviv, located on the Mediterranean coastline. However, this location's name was influenced by Ezekiel 3:15. ^ Ronald Ernest Clements (1 January 1996). Ezekiel. Westminster John Knox Press. p. 1. ISBN 978-0-664-25272-4. ^ Walther Eichrodt (20 June 2003). Ezekiel: A Commentary. Westminster John Knox Press. p. 407. ISBN 978-1-61164-596-5. ^ Alphonsus Maria de' Liguori, The Glories of Mary, Liguori, Mo. : Liguori Publications, 2000, p. 623. ISBN 0-7648-0664-5. ^ "Jewishencyclopedia.com". Jewishencyclopedia.com. Retrieved 2012-06-22. ^ "Iraq Cleric Slams Plan to Turn Jewish Tomb into Mosque". Thejc.com. 2010-04-12. Retrieved 2012-06-22. Broome, Edwin C., Jr. (September 1946). "Ezekiel's Abnormal Personality". Journal of Biblical Literature. 65: 277–292. Eissfeldt, Otto (1965). The Old Testament: An Introduction. Peter Ackroyd, trans. Oxford: Blackwell. Gottwald, Norman K. (1985). The Hebrew Bible: A Socio-Literary Introduction. Philadelphia: Fortress Press. ISBN 0-8006-0853-4. Greenberg, Moshe (1983). Ezekiel 1–20: A New Translation with Introduction and Commentary. Garden City, NY: Doubleday. ISBN 0-385-00954-2. Greenberg, Moshe (1997). Ezekiel 21–37: A New Translation with Introduction and Commentary. New York: Doubleday. ISBN 0-385-18200-7. Klein, Ralph W. (1988). Ezekiel: The Prophet and his Message. Columbia, SC: University of South Carolina Press. ISBN 0-87249-553-1. Herbermann, Charles, ed. (1913). "Ezechiel" . Catholic Encyclopedia. New York: Robert Appleton Company.